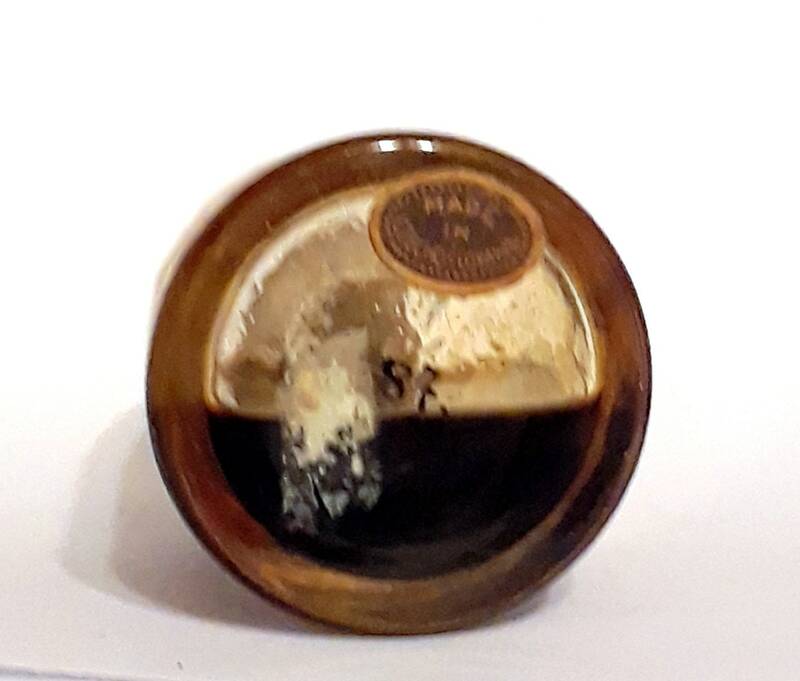 RARE Antique 1920s-1930s Harem by Mohamed Ennifar 0.5 oz Pure Parfum Tunisia Perfume Oil Ittar Czech Glass Bottle. Please see the photo for the actual fill level of the perfume. The perfume was hand blended and smells like it does contain alcohol. It was most likely produced for the tourist trade in Tunisia. 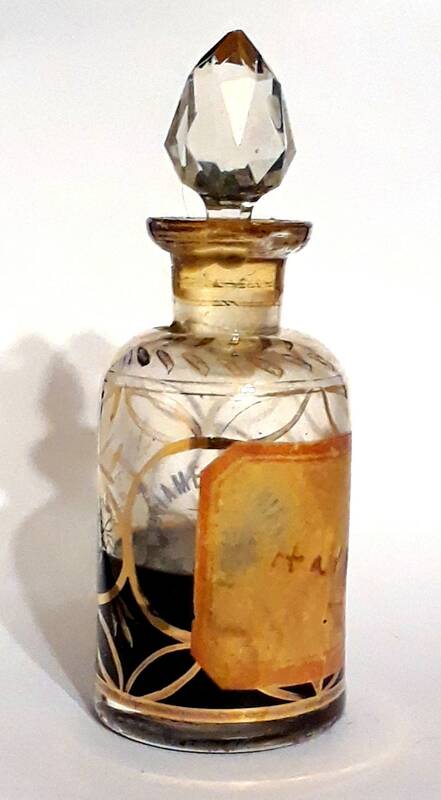 The bottle was made in Czechoslovakia and is a thin, fragile crystal, decorated with arabesques and floral motifs hand painted in gilt enamel. The bottle is acid etched with Mohamed Ennifar's name and address. The ground glass stopper is cut and faceted. The bottle sports a paper label with the perfume name hand written. There is overall wear and discoloration to the paper label. The gilt decoration may show signs of wear on the glass. Some fleabites might be present around the mouth of the bottle. The perfume is old and not as fresh as it once was. The perfume itself smells like very strong floral oriental perfume. It can be used to make perfumes or to be worn as is by itself on the skin. The heat of your skin allows the fragrance to bloom. 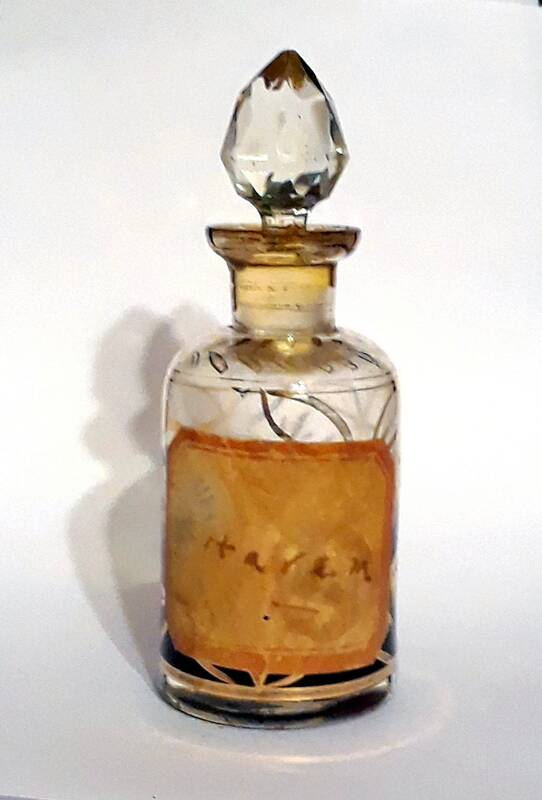 This is one of a series of antique perfume bottles I acquired from an estate, each will be listed separately. 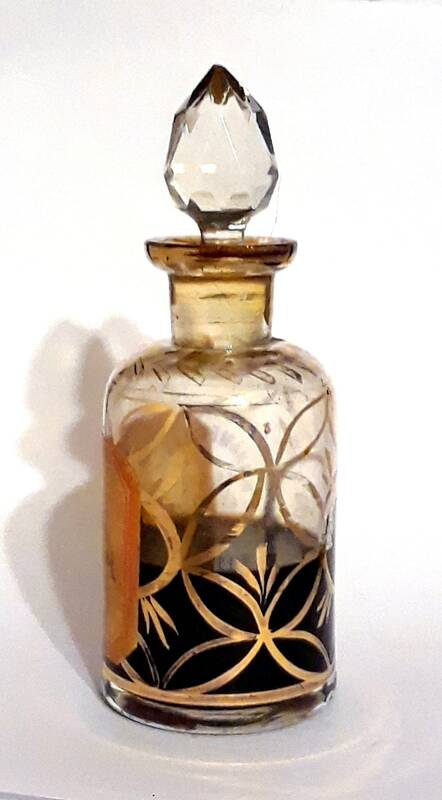 These bottle were custom made in Tunisia in the 1920s by Mohamed Ennifar. Mohamed Ennifar had a perfumery that dated back to the turn of the last century, I found him referenced in two books, I have copied the passages which mention him. "This is the Street of the Perfumers explained Gioconda.It is the most aristocratic part of the bazaars. The perfumers are Moors of Spanish descent and they are very proud. They say that some of them still keep the keys of their palaces at Granada and Cordova but I have never asked them if it is true. Most of them are so rich that they need never make another penny but they come still just because their fathers did I suppose. The shops were small and had but a single counter crowded with bottles of gilt and coloured glass bunches of tall candles and slender phials of perfume a foot or more long were suspended from above and jars of essences and oils filled the shelves on either side. Their owners reclined on the seats behind the counters idly conversing with their friends or customers. They were pale of complexion and dressed in rich materials of delicate hues aesthetic vendors of aesthetic wares. Gioconda paused before one of them, "I will introduce you to this man", she whispered. "Mohammed Enifar [sic] is an old friend of papa's." An elderly Arab behind the counter smiled and saluted them gravely. "All the friends of mademoiselle are my friends," he said signing to them to sit down. His manner was that of a prince entertaining honoured guests. He enquired after the health of Ciccio, Scarfi hoped that Riccardo would be favourably impressed with Tunis and was surprised to hear that he had not yet seen the fine new gardens of the Belvedere. The next moment an attendant who had obeyed a word from him on their approach, brought them two cups of thick sweet coffee. "Mademoiselle permit me," Mohammed Enifar was reaching down one of his slender phials and pouring out one two three precious drops into each cup. "Had monsieur come from Sicily? Was he staying long? Had he visited the Casino?" He begged that mademoiselle would allow him to perfume her handkerchief. Gioconda laughingly assented and so did Riccardo. 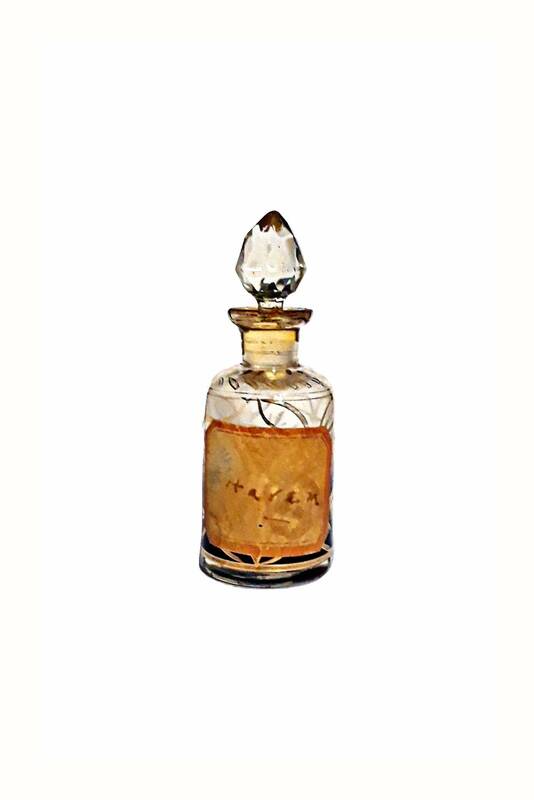 He insisted that they should choose the essence which they preferred: ambergris, jasmine, attar of roses, musk, lentisk, rosemary, geranium, camphorwood, essence of the Bey, all the exquisite category of Oriental perfumes, and as they sipped their coffee they smelt at each the perfumer touching the palms of their hands with the glass stoppers until the air was rioting with strange heavy scents. When they had finished their perfumed coffee, Gioconda thanked him and took ceremonious leave. He uttered a soft sentence in Arabic but she smilingly shook her head and passed on." "The Arab trading quarter of Tunis is set apart from the rest of Tunis by walls, and by infinitely more than walls. One drives in a carriage to the gate of the trading quarter. There one leaves tire carriage and passes through the gate and into the souk, tire great marketplace like a bazaar of India. Here is a world completely Oriental. Here murder or marriage might just have happened and no man’s face would tell. The streets are narrow and twisty; they are dim because each street is covered over, is vaulted like an arcade. One street is filled with the shops of the silversmiths. In the next, the tailors ply their needles. Then the shoemakers fashion yellow slippers for men, red slippers for women. They embroider them with blue thread and threads of gold. Beyond is the street of the dealers in rugs and leather, in silks and damasks and embroideries. I had seen his advertisement and felt that I must call upon him. Though I was somewhat hesitant about going into the presence of a man who vaunted such knowledge. He received me graciously, rising from the cushion upon which he sat and bowing to me as I entered. He seated me upon a divan. He served me coffee that was thick and black and sweet smelling. And always he talked of perfume, not infrequently reminding me that the Prophet himself loved not only beautiful women but the odor of perfumes as well. Of attar of roses, perhaps. Of mimosa. White jasmine. Narcissus. The perfume of sandalwood. Cedarwood. And ambergris. For a long time he talked and the perfume of his talk was like the perfume of his flowers. When finally he knew I was roused by his talk and by his perfumes, the Arab with the white beard opened a bottle and drew the long glass stopper through the air. The old rogue was so successful in capturing me with his beautiful talk, even though a good part of it was obviously a retelling of the tales of Scheherazade, that I bought bottles and bottles of his perfume. They were expensive, those perfumes; but, after all, money is not to be considered when one can buy both the morning breath of the flowers and the fabulous talk of a white bearded Arab telling of incense and amber. I left the Street of the Perfumers and came to the Souk-el-Leffa where are shops offering Tunisian silks. Bedspreads from Gafsa. Rugs from Persia. Silks from China. Brass from India."